This is an incredible .177 caliber five shot semi-automatic CO2 pistol designed specifically for 10 meter competitive target shooting. Can be powered either by 12 g powerlet or bulk fill. Its specifications fully comply with UTI regulations for international shooting competitions for compressed air pistols at 10 meters. Extremely well balanced. Has won a reputation for excellent accuracy. Designed to make it possible to adjust controls according to individual needs of user. The model DU-10 features a fully adjustable trigger, compensator, micrometric sights, and a quick action trigger mechanism with an option to preset the trigger pull. The accuracy and overall high quality of the finish provides an outstanding performance. 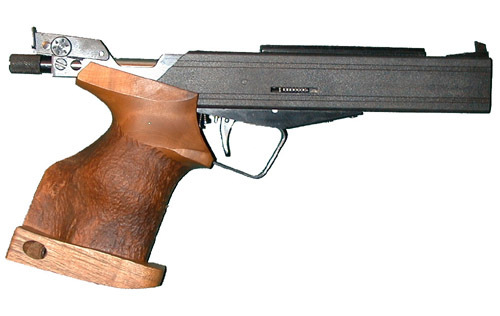 This super Target Pistol made in the Czech Republic. Comes fully equipped in a custom carrying case. Things I liked: It's a true semi-auto with a very good trigger. Handling is nice and it's easy to mount a red dot with the factory provided rail. Accuracy is very good as well. I got mine because I saw one for sale (relatively) cheap and wanted to see how it compared to the Aeron B-96 I already owned. I use both of these pistols for NRA bullseye practice as well as just plain fun. Things I would have changed: It would be nice if the gun came with a US paintball threaded bulk fill endcap as well as a standard US threaded and designed paintball style bulk bottle rather than the European threaded version. Adapters are available for little $$ and make filling this pistol with bulk CO2 much easier with standard sized paintball bottles. What others should know: It has an excellent trigger, but it's not a 10M match trigger. It's a very, very good sport trigger or something similar to a target rimfire or centerfire trigger. It's a slightly "squishy" feeling trigger, but you have to concentrate to feel it. They aren't kidding when they say you need properly sized pellets to work in this pistol. If your pellet skirt is too large, the unique magazine style will cause the gun to fire more than one pellet at a time. This may sound neato, but you'll just get two pellets hitting the target far lower than you had planned as well as with much less velocity than you wanted. As it is, the pistol is provided with a pellet sizer. I suggest you use it as it's easy to feed pellets through and it eliminates "doubling" on shots. Accuracy is excellent, but again not up to 10M match standards. Cloverleafed groups for the entire magazine off a rest at 10M is possble. One hole, not with this gun. Then again, it's supposed to be a semi-auto trainer and in that role, it excells. Also, it's a heck of a plinker and all around fun gun to shoot. Seeing as there are precious few TRUE semi-auto airguns (a gun that both advances the next round and recocks the action with the trigger only serving to release the striker), this one is a gem. 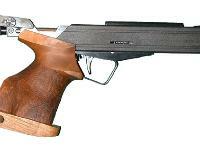 Is this pistol available for sale anywhere in North America anymore?